Granite ( /ˈɡrænɪt/ ) is a common type of felsic intrusive igneous rock that is granular and phaneritic in texture. Granites can be predominantly white, pink, or gray in color, depending on their mineralogy. The word "granite" comes from the Latin granum, a grain, in reference to the coarse-grained structure of such a holocrystalline rock. 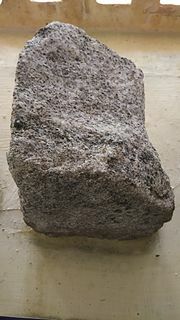 Strictly speaking, granite is an igneous rock with between 20% and 60% quartz by volume, and at least 35% of the total feldspar consisting of alkali feldspar, although commonly the term "granite" is used to refer to a wider range of coarse-grained igneous rocks containing quartz and feldspar. Compressive strength or compression strength is the capacity of a material or structure to withstand loads tending to reduce size, as opposed to tensile strength, which withstands loads tending to elongate. In other words, compressive strength resists compression, whereas tensile strength resists tension. In the study of strength of materials, tensile strength, compressive strength, and shear strength can be analyzed independently. Permeability in fluid mechanics and the earth sciences is a measure of the ability of a porous material to allow fluids to pass through it. In geology, a pluton is a body of intrusive igneous rock that is crystallized from magma slowly cooling below the surface of the Earth. While pluton is a general term to describe an intrusive igneous body, there has been some confusion around the world as to what is the definition of a pluton. Pluton has been used to describe any non-tabular intrusive body, and batholith has been used to describe systems of plutons. In other literature, batholith and pluton have been used interchangeably. In central Europe, smaller bodies are described as batholiths and larger bodies as plutons. In practice the term pluton most often means a non-tabular igneous intrusive body. The most common rock types in plutons are granite, granodiorite, tonalite, monzonite, and quartz diorite. Generally light colored, coarse-grained plutons of these compositions are referred to as granitoids. 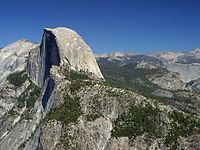 Examples of plutons include Denali in Alaska; Cuillin in Skye, Scotland; Cardinal Peak in Washington State; Mount Kinabalu in Malaysia; and Stone Mountain in the US state of Georgia. Granite containing rock is widely distributed throughout the continental crust. 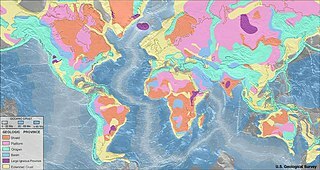 Much of it was intruded during the Precambrian age; it is the most abundant basement rock that underlies the relatively thin sedimentary veneer of the continents. Outcrops of granite tend to form tors and rounded massifs. Granites sometimes occur in circular depressions surrounded by a range of hills, formed by the metamorphic aureole or hornfels. Granite often occurs as relatively small, less than 100 km2 stock masses (stocks) and in batholiths that are often associated with orogenic mountain ranges. Small dikes of granitic composition called aplites are often associated with the margins of granitic intrusions. In some locations, very coarse-grained pegmatite masses occur with granite. The letter-based Chappell & White classification system was proposed initially to divide granites into I-type (igneous source) granite and S-type (sedimentary sources). Both types are produced by partial melting of crustal rocks, either metaigneous rocks or metasedimentary rocks. A-type granites were defined as to occur in anorogenic setting, have alkaline and anhydrous compositions. They show a peculiar mineralogy and geochemistry, with particularly high silicon and potassium at the expense of calcium and magnesium. These granites are produced by partial melting of refractory lithology such as granulites in the lower continental crust at high thermal gradients. This leads to significant extraction of hydrous felsic melts from granulite-facies resitites. A-type granites occur in the Koettlitz Glacier Alkaline Province in the Royal Society Range, Antarctica. The rhyolites of the Yellowstone Caldera are examples of volcanic equivalents of A-type granite. Of these two mechanisms, Stokes diapir was favoured for many years in the absence of a reasonable alternative. The basic idea is that magma will rise through the crust as a single mass through buoyancy. As it rises, it heats the wall rocks, causing them to behave as a power-law fluid and thus flow around the pluton allowing it to pass rapidly and without major heat loss. This is entirely feasible in the warm, ductile lower crust where rocks are easily deformed, but runs into problems in the upper crust which is far colder and more brittle. 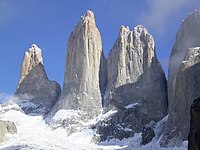 Rocks there do not deform so easily: for magma to rise as a pluton it would expend far too much energy in heating wall rocks, thus cooling and solidifying before reaching higher levels within the crust. Fracture propagation is the mechanism preferred by many geologists as it largely eliminates the major problems of moving a huge mass of magma through cold brittle crust. Magma rises instead in small channels along self-propagating dykes which form along new or pre-existing fracture or fault systems and networks of active shear zones. As these narrow conduits open, the first magma to enter solidifies and provides a form of insulation for later magma. Chemical weathering of granite occurs when dilute carbonic acid, and other acids present in rain and soil waters, alter feldspar in a process called hydrolysis. As demonstrated in the following reaction, this causes potassium feldspar to form kaolinite, with potassium ions, bicarbonate, and silica in solution as byproducts. An end product of granite weathering is grus, which is often made up of coarse-grained fragments of disintegrated granite. There is some concern that some granite sold as countertops or building material may be hazardous to health. Dan Steck of St. Johns University has stated  that approximately 5% of all granite is of concern, with the caveat that only a tiny percentage of the tens of thousands of granite slab types have been tested. Various resources from national geological survey organizations are accessible online to assist in assessing the risk factors in granite country and design rules relating, in particular, to preventing accumulation of radon gas in enclosed basements and dwellings. The Red Pyramid of Egypt (c. 26th century BC), named for the light crimson hue of its exposed limestone surfaces, is the third largest of Egyptian pyramids. Menkaure's Pyramid, likely dating to the same era, was constructed of limestone and granite blocks. The Great Pyramid of Giza (c. 2580 BC) contains a huge granite sarcophagus fashioned of "Red Aswan Granite". The mostly ruined Black Pyramid dating from the reign of Amenemhat III once had a polished granite pyramidion or capstone, which is now on display in the main hall of the Egyptian Museum in Cairo (see Dahshur). Other uses in Ancient Egypt include columns, door lintels, sills, jambs, and wall and floor veneer. How the Egyptians worked the solid granite is still a matter of debate. Patrick Hunt  has postulated that the Egyptians used emery, which has greater hardness on the Mohs scale. A key breakthrough was the invention of steam-powered cutting and dressing tools by Alexander MacDonald of Aberdeen, inspired by seeing ancient Egyptian granite carvings. In 1832, the first polished tombstone of Aberdeen granite to be erected in an English cemetery was installed at Kensal Green Cemetery. It caused a sensation in the London monumental trade and for some years all polished granite ordered came from MacDonald's. As a result of the work of sculptor William Leslie, and later Sidney Field, granite memorials became a major status symbol in Victorian Britain. The royal sarcophagus at Frogmore was probably the pinnacle of its work, and at 30 tons one of the largest. It was not until the 1880s that rival machinery and works could compete with the MacDonald works. Migmatite is a rock that is a mixture of metamorphic rock and igneous rock. It is created when a metamorphic rock such as gneiss partially melts, and then that melt recrystallizes into an igneous rock, creating a mixture of the unmelted metamorphic part with the recrystallized igneous part. They can also be known as diatexite. Charnockite is applied to any orthopyroxene-bearing quartz-feldspar rock, formed at high temperature and pressure, commonly found in granulite facies metamorphic regions, as an end-member of the charnockite series. The rock cycle is a basic concept in geology that describes the transitions through geologic time among the three main rock types: sedimentary, metamorphic, and igneous. 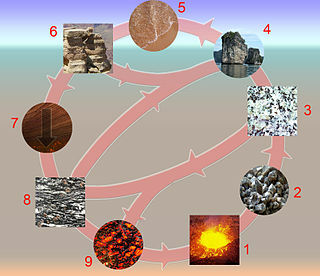 As the adjacent diagram illustrates, each of the types of rocks is altered or destroyed when it is forced out of its equilibrium conditions. An igneous rock such as basalt may break down and dissolve when exposed to the atmosphere, or melt as it is subducted under a continent. Due to the driving forces of the rock cycle, plate tectonics and the water cycle, rocks do not remain in equilibrium and are forced to change as they encounter new environments. 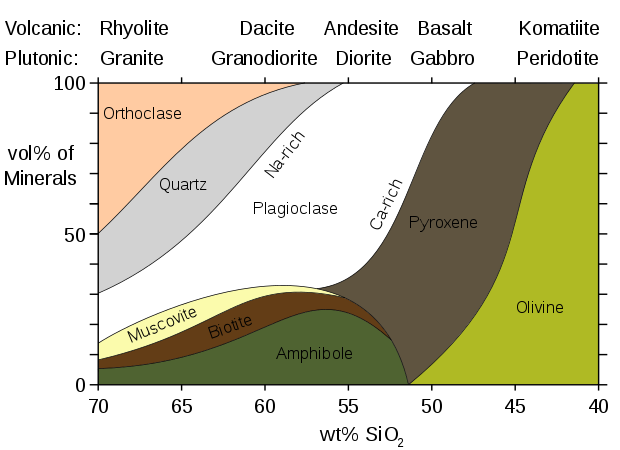 The rock cycle is an illustration that explains how the three rock types are related to each other, and how processes change from one type to another over time. This cyclical aspect makes rock change a geologic cycle and, on planets containing life, a biogeochemical cycle. Granophyre is a subvolcanic rock that contains quartz and alkali feldspar in characteristic angular intergrowths such as those in the accompanying image. Anatexis in geology, refers to the differential, or partial, melting of rocks, especially in the forming of metamorphic rocks such as migmatites. Restite is the residual material left at the site of melting during the in place production of granite through intense metamorphism. In geology, igneous differentiation, or magmatic differentiation, is an umbrella term for the various processes by which magmas undergo bulk chemical change during the partial melting process, cooling, emplacement, or eruption. Fractional crystallization, or crystal fractionation, is one of the most important geochemical and physical processes operating within the Earth's crust and mantle. It is important in the formation of igneous rocks because it is one of the main processes of magmatic differentiation. Fractional crystallization is also important in the formation of sedimentary evaporite rocks. Monzogranites are biotite granite rocks that are considered to be the final fractionation product of magma. Monzogranites are characteristically felsic (SiO2 > 73%, and FeO + MgO + TiO2 < 2.4), weakly peraluminous (Al2O3/ (CaO + Na2O + K2O) = 0.98–1.11), and contain ilmenite, sphene, apatite and zircon as accessory minerals. Although the compositional range of the monzogranites is small, it defines a differentiation trend that is essentially controlled by biotite and plagioclase fractionation. (Fagiono, 2002). Monzogranites can be divided into two groups (magnesio-potassic monzogranite and ferro-potassic monzogranite) and are further categorized into rock types based on their macroscopic characteristics, melt characteristics, specific features, available isotopic data, and the locality in which they are found. Leucogranite is a light-colored, granitic, igneous rock with almost no dark minerals. Alaskite is a synonym. Alkali feldspar granite, some varieties of which are called 'red granite', is a felsic igneous rock and a type of granite rich in the mineral potassium feldspar (K-spar). It is a dense rock with a phaneritic texture. The abundance of K-spar gives the rock a predominant pink to reddish hue; peppered with minor amounts of black minerals. Tonalite-trondhjemite-granodiorite rocks or TTG rocks are intrusive rocks with typical granitic composition but containing only a small portion of potassium feldspar. Tonalite, trondhjemite, and granodiorite often occur together in geological records, indicating similar petrogenetic processes. Post Archean TTG rocks are present in arc-related batholiths, as well as in ophiolites, while Archean TTG rocks are major components of Archean cratons. ↑ "Granitoids – Granite and the Related Rocks Granodiorite, Diorite and Tonalite". Geology.about.com. 2010-02-06. Retrieved 2010-05-09. ↑ Haldar, S.K. ; Tišljar, J. (2014). Introduction to Mineralogy and Petrology. Elsevier. p. 116. ISBN 978-0-12-408133-8. 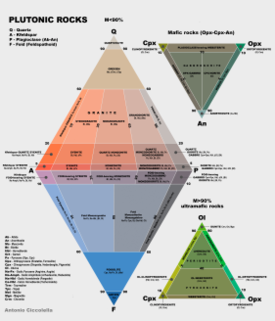 ↑ "Rock Types and Specific Gravities". EduMine. Retrieved 2017-08-27. ↑ Kumagai, Naoichi; Sadao Sasajima; Hidebumi Ito (1978). "Long-term Creep of Rocks: Results with Large Specimens Obtained in about 20 Years and Those with Small Specimens in about 3 Years". Journal of the Society of Materials Science (Japan). 27 (293): 157–161. doi:10.2472/jsms.27.155. ↑ Larsen, Esper S. (1929). "The temperatures of magmas". American Mineralogist. 14: 81–94. ↑ Holland, Tim; Powell, Roger (2001). "Calculation of phase relations involving haplogranitic melts using an internally consistent thermodynamic dataset". Journal of Petrology. 42 (4): 673–683. Bibcode:2001JPet...42..673H. doi:10.1093/petrology/42.4.673. ↑ Harvey Blatt & Robert J. Tracy (1997). Petrology (2nd ed.). New York: Freeman. p. 66. ISBN 0-7167-2438-3. ↑ Singh, G. (2009). Earth Science Today. Discovery Publishing House. ISBN 9788183564380. ↑ Chappell, B. W.; White, A. J. R. (2001). Two contrasting granite types: 25 years later. Australian Journal of Earth Sciences, 48: 489–499. ↑ Winter, J.D. (2010) Principles of Igneous and Metamorphic Petrology. 2nd Edition, page 381. ↑ Zheng, Y.-F., Chen, R.-X., 2017. Regional metamorphism at extreme conditions: Implications for orogeny at convergent plate margins. Journal of Asian Earth Sciences, 145: 46-73. ↑ Weinberg, R. F.; Podladchikov, Y. (1994). "Diapiric ascent of magmas through power law crust and mantle". Journal of Geophysical Research. 99: 9543. Bibcode:1994JGR....99.9543W. doi:10.1029/93JB03461. ↑ Clemens, John (1998). "Observations on the origins and ascent mechanisms of granitic magmas". Journal of the Geological Society of London. 155 (Part 5): 843–51. Bibcode:1998JGSoc.155..843C. doi:10.1144/gsjgs.155.5.0843. ↑ "Granite [Weathering]". University College London . Retrieved 10 July 2014. ↑ "Hydrolysis". Geological Society of London . Retrieved 10 July 2014. ↑ Marsh, William M.; Kaufman, Martin M. (2012). Physical Geography: Great Systems and Global Environments. Cambridge University Press. p. 510. ISBN 9781107376649. ↑ "Decay series of Uranium". Archived from the original on March 9, 2012. Retrieved 2008-10-19. ↑ "Radon and Cancer: Questions and Answers". National Cancer Institute. Retrieved 2008-10-19. ↑ Hubbert, M. King (March 8, 1956) Nuclear Energy and the Fossil Fuels. American Petroleum Institute Conference. Energy Bulletin. ↑ Adams, J. A.; Kline, M. C.; Richardson, K. A.; Rogers, J. J. (1962). "The Conway Granite of New Hampshire As a Major Low-Grade Thorium Resource". Proceedings of the National Academy of Sciences of the United States of America. 48 (11): 1898–905. Bibcode:1962PNAS...48.1898A. doi:10.1073/pnas.48.11.1898. PMC 221093 . PMID 16591014. ↑ Steck, Daniel J. (2009). "Pre- and Post-Market Measurements of Gamma Radiation and Radon Emanation from a Large Sample of Decorative Granites". Nineteenth International Radon Symposium (PDF). pp. 28–51. ↑ Natural Stone Countertops and Radon – Environmental Health and Engineering – Assessing Exposure to Radon and Radiation from Granite Countertops. ↑ Nelson L. Nemerow (27 January 2009). Environmental Engineering: Environmental Health and Safety for Municipal Infrastructure, Land Use and Planning, and Industry. John Wiley & Sons. p. 40. ISBN 978-0-470-08305-5. ↑ Parmodh Alexander (15 January 2009). A Handbook of Minerals, Crystals, Rocks and Ores. New India Publishing. p. 585. ISBN 978-81-907237-8-7. ↑ James A. Harrell. "Decorative Stones in the Pre-Ottoman Islamic Buildings of Cairo, Egypt" . Retrieved 2008-01-06. ↑ "Egyptian Genius: Stoneworking for Eternity". Archived from the original on 2007-10-14. Retrieved 2008-01-06. ↑ Heitzman, James (1991). "Ritual Polity and Economy: The Transactional Network of an Imperial Temple in Medieval South India". Journal of the Economic and Social History of the Orient. BRILL. 34 (1/2): 23–54. doi:10.1163/156852091x00157. JSTOR 3632277. 1 2 Waters, Michael (2016). "Reviving Antiquity with Granite: Spolia and the Development of Roman Renaissance Architecture". Architectural History. 59: 149–179. ↑ "Black granite and black marble". Trade Brochure. Graniteland.com. Retrieved 21 May 2014. ↑ Roach, John (October 27, 2004). "National Geographic News — Puffins Return to Scottish Island Famous for Curling Stones". National Geographic News. Wikimedia Commons has media related to Granite .